We KNOW they do a task of some sort in HANOI...so prob yes! I love it when they do that, instead of just go from the Pitstop to their Next destination!!!! I just saw a mini promo on CBS during the basketball game, I thought I saw a new clip. Thanks Jimmer, keep the times coming, we will watch! So they caught their scorpions....now what?? Fry it over a campfire and eat them like s'mores? We saw Max's shocked face to a bushmen eating a scorpion in the preview. I think those are clouds. I'll email you a copy. They are not clouds. I don't THINK I am seeing things in the bushes! Water tanks, maybe? I remember something about water tanks in TAR7 legs in Botswana. 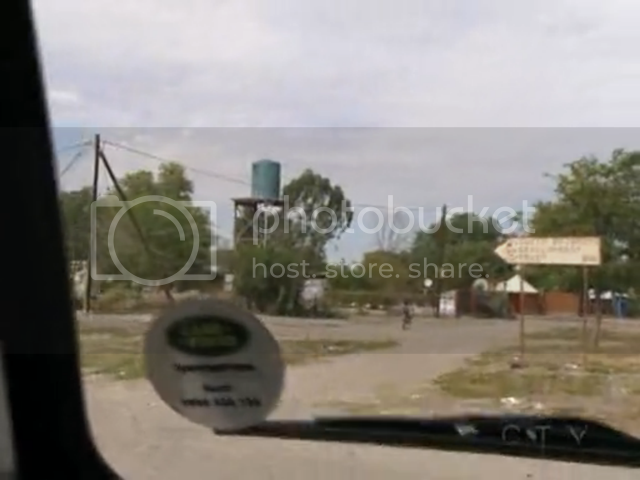 They had to drive past a water tank in Maun on Season 7, Leg 7. IDK if there is a connection at all. I am looking for that ep now, great minds think alike! And STRAIGHT 2 sides below. Cylindrical. on CBS web,so the show will delay on East/midwest zone?